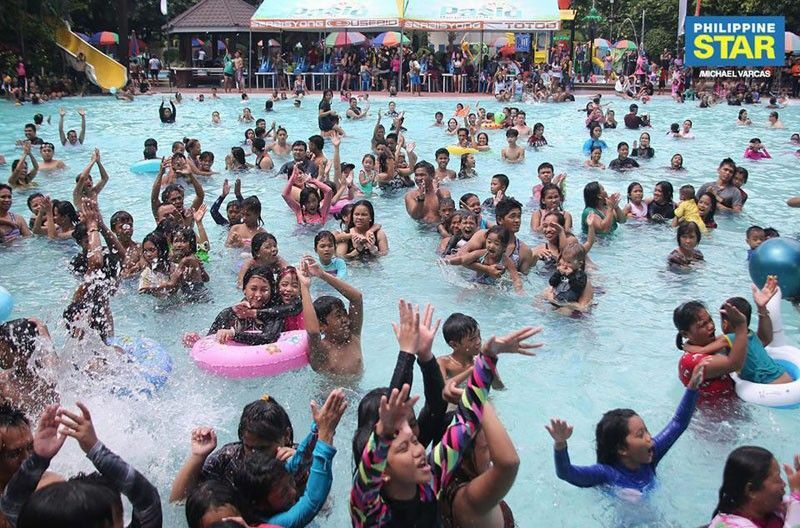 Amid a water shortage, people enjoy the swimming pool at the Pasig Rainforest Park yesterday. MANILA, Philippines — The water shortage situation in Metro Manila is seen to improve in the next weeks as concessionaire Manila Water reported that it has restored supply to about 80 percent of its customers as of Friday. This improvement came after it started imposing a rotational water supply scheme on Thursday. “They already have water in their taps. This translates to over one million households. This can only get better in the coming weeks, in the coming months as we have observed. We implemented this new scheme beginning Thursday afternoon and we’ve been seeing marked improvements,” said Dittie Galang, Manila Water’s communications planning and tactical development manager. “But most of those that had no water in the past days in Mandaluyong already have water in their taps,” Galang said, although she qualified that the water pressure customers are receiving may not be as strong as in previous months. On Friday, Manila Water assured customers that its 20-hour water interruptions would not last throughout summer as it cited the initial positive effects of the rotational water supply scheme. “Levels of various reservoirs have started to increase and water supply, though still at low pressure in some areas, is slowly being distributed to severely affected barangays. These operational adjustments are a temporary measure that Manila Water is undertaking to balance the water supply distribution in its concession area… Manila Water continues to make calibrations in these adjustments to ensure that extended service interruptions will not last for the entire summer,” the company said in a statement. The water firm earlier announced it would implement a water interruption scheme with a more definitive schedule as it aims to stabilize the distribution of available supply and help slow down the rapid decline of the water level at La Mesa Dam, which is its reserve resource. After maximizing its allocation from Angat Dam at 1,600 million liters per day, Manila Water turns to La Mesa Dam for additional supply. Aside from this, it is also prioritizing the energization of the water treatment plant in Cardona, Rizal, which is part of the Rizal Province Water Supply Improvement Project, as among its immediate solutions to cope with the surging demand. “The project is now delivering an initial 22 million liters per day and is expected to produce up to 50 million liters per day by mid-April,” it said. The Metropolitan Waterworks and Sewerage System (MWSS) also said tapping deep wells could be part of the short-term solutions to address the current water crisis. Meanwhile, the MWSS is calling an inter-agency meeting today to discuss the execution of San Miguel Corp. (SMC)’s offer to help and use its untapped water allocation from Angat Dam. “To operationalize SMC’s offer to help deliver 140 million liters of clean, treated water to areas affected by the shortage, MWSS administrator Reynaldo Velasco is calling for a special meeting among top officials of Manila Water, Maynilad, Bulacan Bulk Water, concerned LGUs, the Bureau of Fire, Association of Volunteer Fire Chiefs and Firefighters of the Philippines on Monday to map out saturation operations over the next two weeks,” MWSS said in a statement. On Friday, SMC announced that, through its Bulacan Bulk Water Treatment Plant, it hopes to be able to deliver 140 million liters of clean, treated water to areas affected by the shortage upon coordination with, and approval by the MWSS. He added that the agency’s “ABC” Projects which aims to generate alternative sources of water with a combined capacity to 1,950 MLD is now in the pipeline. These involve the optimization of the untapped 800 MLD from Angat-Norzagaray river, 350 MLD from Bayabas Dam and 800 MLD from the Candaba impounding dam—SMC projects that will secure water security in Metro Manila. “This situation is unfortunate and dire for many of our countrymen who do not have access to basic water. Many are affected: households, hospitals, schools, businesses. Right now, the best thing we can do is to pull together and help each other,” Ang earlier said. He added that the undertaking, will not be easy since an estimated 14,000 truck trips per day using 10-kiloliter tankers or 7,000 trips per day using 20 kl tankers are needed to deliver clean water. In January, SMC operationalized Stage 1 of its Bulacan Bulk Water Project, which can supply water to 24 Bulacan water districts. Ang explained that currently, the project has a production capacity of 200 million liters per day. However, as many water districts have yet to upgrade and prepare their facilities to receive water from the BBWSP, only about 60 million liters per day are currently being utilized. “This leaves an excess capacity of about 140 million liters per day, which is enough to serve the average daily requirements of two million people or about 455,000 households. As a quick response to the situation of customers of Manila Water, we will coordinate with MWSS and local government units to secure permits to place water refilling stations in affected areas,” Ang said. Among the affected areas are: Mandaluyong (all barangays), San Juan (five barangays), Pasig (seven barangays), Angono (three barangays), Antipolo (10 barangays), Taytay (three barangays) and Binangonan (12 barangays). Officials are finalizing an executive order that seeks to address the water crisis and proposes to turn the National Water Resources Board (NWRB) into a body that will craft policies on water-related issues, Malacañang said yesterday. Cabinet Secretary Karlo Nograles said the proposed EO, which will cover the components of integrated water resource management, was discussed during a Cabinet Assistance System meeting in Leyte last Friday. “I believe the different agencies agree on the problems that need to be resolved to prevent the sort of water supply management issues now being experienced in Metro Manila. At this point we have built a consensus on how we can address these issues, but the recommendations as outlined in the EO will still be subject to the approval of the President,” Nograles said in a statement. The proposed EO aims to reconstitute the NWRB into a body that will craft policies, set directions and integrate all state efforts on water-related concerns. Nograles said the body might be placed under the Office of the President. The NWRB was placed under the supervision of the environment department in 2002 by Executive Order No. 123. “Given the scope and breadth of water-related concerns, the supervision of OP could help ensure that all 30-plus agencies involved in water resource management are on the same page,” Nograles said. The body would also be tasked to come up with a national water management master plan that would integrate all relevant and existing plans and roadmaps of different agencies involved in water resource management. “They know that to address the problems of our countrymen, it is better to help each other rather than point fingers. I believe that this is the approach to take with any challenge facing our country,” he added. There are at least 32 agencies involved in the water sector. Nograles previously said the Cabinet Assistance System is working on issues like the limited implementation of integrated water resources management in many of the country’s river basins and watersheds, which results in wastage and uncoordinated plans and programs, quantifying the extent of water sector issues, and access to safe water supplies.